This page includes a list of any available job vacancies in Playa del Ingles as well as tips and advice on where to find Playa del Ingles, Gran Canaria, Spain, jobs in 2019. On this page we guide you on how to find work in Playa del Ingles and where to find jobs in Playa del Ingles on the popular Spanish Canary island of Gran Canaria. Playa del Ingles is the best place on Gran Canaria to search for jobs because it is Gran Canaria’s biggest and most famous resort. Sure the neighbouring resort of Maspalomas has the famous sand dunes and wonderful beach but Playa del Ingles has the lively image with plenty of bars and a great nightlife scene to entertain you once the sun has set. Playa del Ingles is famous throughout Europe and visitors are a mix of many nationalities, not just British but also many German, French, Dutch, and Scandinavian tourists who come to enjoy the beaches, restaurants, bars and clubs. This would be a great place to find a holiday rep job in Spain. Playa del Ingles attracts the younger aged tourists and there is a definite gay commmunity who know to come here. The beach, known as Playa del Inglés is 4km long and joins the Playa de Maspalomas. You will find many different types of watersports you can do such as parasailing, jet-skiing and waterskiing. Three are three very good golf courses close to Playa del Inglés, these are Campo de Golf de Maspalomas which is at the famous Maspalomas sand dunes, Salobre Golf and Meloneras Golf. 1. The main Playa del Ingles tourist information offices is located next to the main entrance to the Yumbo Shopping centre, on the corner of Av. de Espana and Av. de los Estados Unidos. Address: Avda. España – esquina con Avda. EE.UU. (Centro Comercial Yumbo), 35100, Playa del Inglés (San Bartolomé de Tirajana). Telephone: 928 771 550. 2. There is another tourist office by the Anexo II shopping centre close to the beach. Address: Paseo Marítimo – Centro Comercial Anexo II Local 20 , 35100, Playa del Inglés (San Bartolomé de Tirajana). Telephone: 928 768 409. Where to Find Jobs in Playa del Ingles, Gran Canaria. 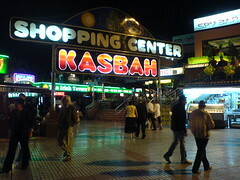 Kasbah, Metropole & Plaza are good spots as they host many shops, restaurants, bars and clubs. But really anywhere in Playa del Ingles as the resort is packed with places that have a serious need for students and seasonal workers in the summer to cater to the needs of the huge influx of tourists to the resort. 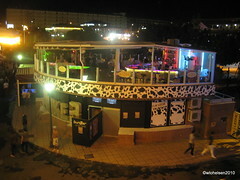 Try also nightclubs such as Plaza and Pacha. The Annexo II complex is right on the beach and with plenty of facilities. Of all of the places in Spain we rate this as the best place for work and jobs if you are gay. Sitges near Barcelona also has a reputation for being a resort many gay men flock to but Playa del Ingles on Gran Canaria is widely known to be the Gran Canaria is the number one gay travel destination in Europe. There are plenty of jobs in the gay bars, nightclubs, caberet and show bars for young men! The Yumbo center is where the gay nightlife happens but couples and even families go here to watch the La Belle drag show from around 11:00pm! See if you can get work in the popular Ricky’s Cabaret Bar which hosts a popular karaoke show, followed by the drag queen comedy show. Bar Junior has live strippers on its terrace. Other popular venues include Construction bar, Na Und Pils Bar, Macho Macho, Cruise, Mykonos and Tubos. Gay clubs include Mantrix, Heaven and Club XL. One of the good points about Gran Canaria is that being close to Africa it is less seasonal than the Balearic Islands such as Ibiza and mainland Spain which of course is much further north. It means more consistent work and job opportunities. 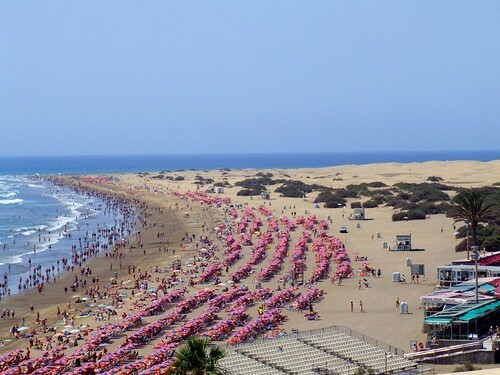 If Playa del Ingles sounds a bit too much like Benidorm then maybe try the quieter and more family orientated resort next door – see our jobs in Maspalomas page or the cultural capital of the island, Las Palmas jobs. Consider some of the other Spanish islands such as the nearby Canary Islands of Tenerife, Lanzarote, Fuerteventura or how about jobs in Ibiza? If you are a company or employer who is searching for staff then please list your job vacancies here for free. If you are looking for jobs in Playa del Ingles please add your e-mail address to our mailing list so should any situations vacant arise, we can send you an e-mail job alert to let you know. Jobs in Playa del Ingles can also be found by the usual means of internet, radio, newspaper, word of mouth, classified jobs section in expat newspapers and recruitment agencies. Without doubt this is the most popular type of job to find in the resort as Playa del Ingles appeals to the younger tourist. If you are unaware, Playa del Ingles is one of the biggest and most popular liveliest gay tourist destinations in Europe. On the south of the Canary Island, Gran Canaria has literally hundreds of bars, pubs, clubs and discos, all needing temporary short-term workers to cope with the summer season in Gran Canaria. There are plenty of opportunities for working as door staff in Playa del Ingles as what are known as door supervisors providing security on the doors to bars and clubs (bouncers). Try these bars and clubs when searching for work: The Hopstore Irish Pub, Mulligans Irish Pub, Eamons Luck O’ the Irish, Linekers Bar, Bar Buddies, Joy, Cream, Friar Tuck’s Bar, Mackers Sports Bar, Bachira, Heaven, Fantasy Island, Hippodrome, Detox Retox, Havana’s, Irish Centre and Pacha. If you are an employer who is searching for staff, please contact us with any job vacancies you wish to fill in Playa del Ingles, Gran Canaria and we will list them for free. Hi. I’m a 22 year old female, looking to move to Spain in May this year and will be looking for any jobs available. Looking for bar or hotel work. I have lots of experience from supervisor to assistant general manager. I am in Playa del Ingles and I look for job. Any job. I am male 41 with Certificate Professional Masseur and certificate Business administration. I worked in the past at bars, restaurants. I cleaned apartments as well. So, I will be very, very thankfully if u help me to find work. Need money to pay rent,food etc..
Will do free massage for the first who helps me to start work. hello please my name is andrea and i looking for job something like cleaning or at the hotel.I am 34 years old and now living in UK.I am from slovakia i live here almost 4 years and i want to spend time in gran canaria thats why i looking for opportunity for work . Currently looking at properties. Also looking for a job. I’m currently a assistant manager. Trained dancer in Latin American and ball room. Line dance and Zumba instructor. Have past experience of running a bar and a hotel.